Jason Karolak’s colors grab your attention like flashing LEDs in a dark-as-midnight casino. Jason Karolak’s current show at McKenzie Fine Art, which comes with the title Prospects, is a follow-up to one that I reviewed in 2015, and it demonstrates a progressive sense of refinement and focus. Despite his continued use of black grounds and electric color, there has been a sweeping change in Karolak’s painting since the first time I encountered it at his Greenpoint studio, which I visited in preparation for a catalogue essay I was writing for a two-person show (with Antoine Lefebvre, curated by Matthew Neil Gehring) at the Flecker Gallery in Selden, New York. Compared to what he is doing now, the work I saw at that time could be reasonably characterized as a hot, holy mess. After covering his enormous canvases with multiple applications of primer, he would paint the entire surface red, which he would then conceal, imperfectly, with coats of black. The red frequently showed through; spots were missed and the skin of the black paint would assume a reddish hue. Upon this roiling black ground, Karolak would paint scores of lines in luminous shades of blue, green, yellow, and violet that would take the shape of awkward cubes, stacked and layered, one over another over another. The resulting work resembled a linear version of action painting, with runny paint, mottled surfaces, and pentimenti galore. These paintings evinced a big talent barreling through the romance of a new formal discovery, a crazy dance over uncharted terrain. If his later work feels more self-confident and controlled, it’s the natural evolution of an approach that would have become disingenuous and frankly dull if he had persisted in the pursuit of wild improvisation — as if he didn’t know what he was in for, when sooner or later he would know, and would have to deal with that eventuality. And so, as the canvases in his previous show suggested, his painting temperature cooled and he became less involved with taming chaos and more engaged with developing a personal sense of architectonics, with the black ground as the most conspicuous holdover from his previous way of working. And since Karolak’s use of black has become one of the few constants in his painting, its ubiquity presents a critical challenge, expressly because it looks so good, which is a somewhat perverse reason to cast suspicion on a body of work. The fluorescent colors he uses invariably glow with a special luminosity when laid against black. Such extreme graphic contrasts are stark and exciting; they grab your attention like flashing LEDs in a dark-as-midnight casino. Some might argue that the black ground has become a habit aided and abetted by the heady visual buzz it generates, but this would be a hasty and superficial reading of the artist’s canniness and mastery. Set his use of black against the formal delimitations practiced by dozens of postwar artists (commencing with Ad Reinhardt and Mark Rothko), and the black ground can be understood as a springboard for formal invention, equally matched by possibilities and pitfalls. Caravaggio painted his entire surface a deep umber and worked lighter passages into it, wet on wet, in order to create his astonishing interplay of light and shadow. 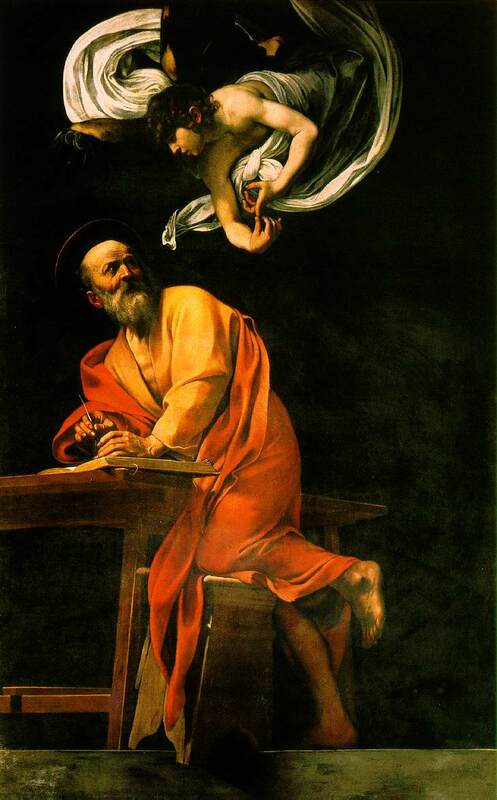 Although there are Caravaggios that use a light to medium ground, such as the incomparable “Basket of Fruit” (c.1599) in the Biblioteca Ambrosiana in Milan, it is impossible to imagine the high drama of the equally incomparable “Denial of Saint Peter” (1610) at New York’s Metropolitan Museum of Art without the darkness that surrounds it. The minimal contextual information that Caravaggio provides in his great religious compositions shifts the focus of the painting’s intent. He is not so much telling the story of Peter’s disavowal of Jesus, in fear of the Roman authorities closing in, as he is presenting the idea of betrayal and remorse (Peter seems to be simultaneously lying and weeping), just as his airborne “Inspiration of Saint Matthew” (1602) in the church of San Luigi dei Francesi in Rome embodies the idea of inspiration. Not to get too far ahead of ourselves, but the formal interactions that Karolak has been exploring up to and including this current show feel like a distinct and cogent contribution to the current conversation. His radiant imagery may evoke the electronic circuitry that makes contemporary life hum, and in that regard, the high contrast of fluorescence against matte black serves an extravisual purpose. But such associations lie in the deep background of perception. What is more to the point is the force with which the black ground isolates and foregrounds the lines and shapes, even those articulated by less intense colors, to such an extent that they read not as compositional conventions but as an idea of line and shape — abstract ideals floating in Platonic space. It’s precisely this sense of isolation and idealization, and the endless possibilities packed inside, that more than justifies Karolak’s unvarying use of black, defining it as a premise rather than an effect. The new paintings are the most varied so far in terms of imagery, with a greater emphasis on muted color and spatial ambiguity. (All the larger pieces are oil on linen, while the smaller ones are oil on linen over panel.) 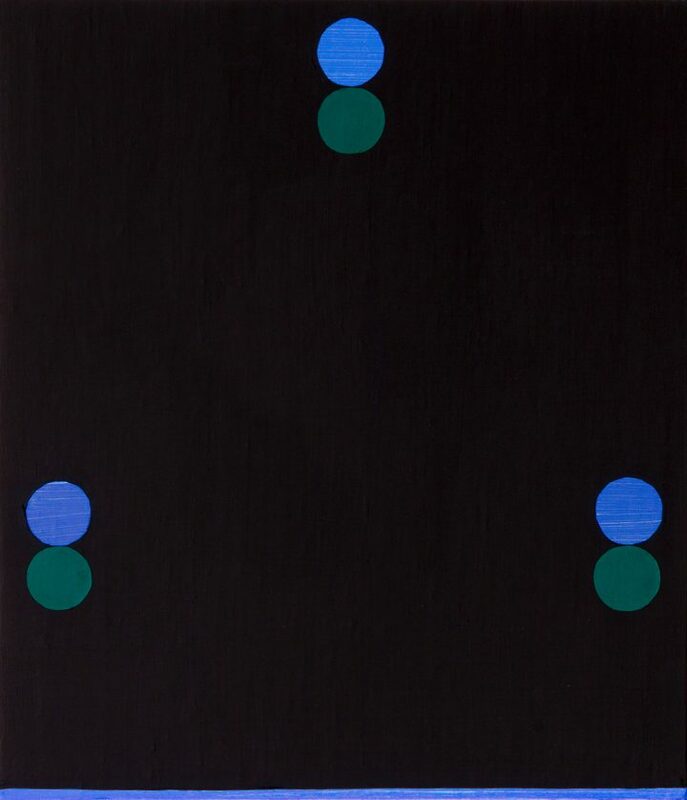 There is one, “Untitled (P-1706)” (2017), that consists solely of six vertically paired, triangularly arranged colored circles — light blue above and dusky green below — so that the lower ones shine with the dark reflections of a nighttime lake. 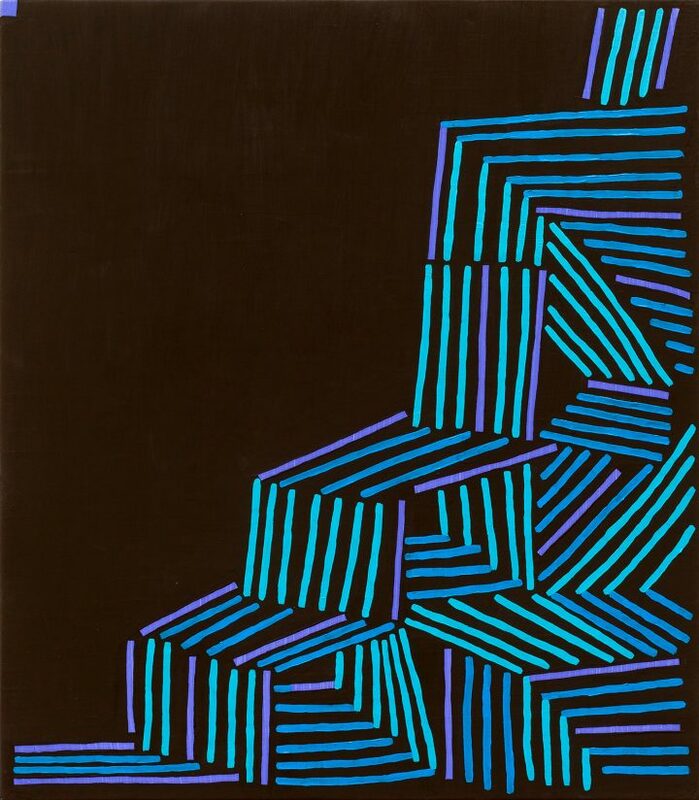 In another, “Untitled (P-1713)” (2017), short lines in three colors (light mint-green, dark blue, and bright purple) zigzag up the right side of the canvas as if climbing a mountainside. 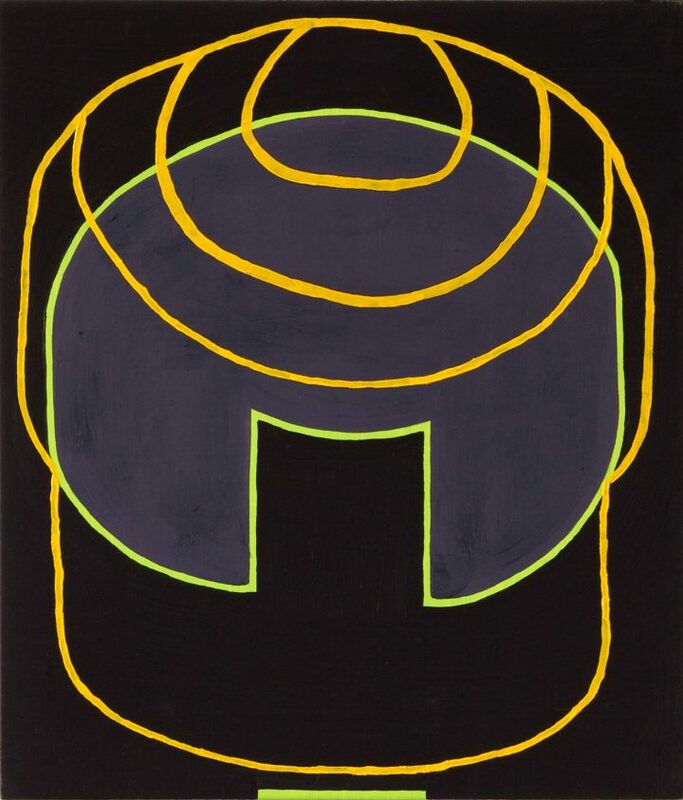 And in yet another, “Untitled (P-1626)” (2016), orange-yellow and yellow-green lines form curving and rounded shapes that enclose a purplish-gray interior. This interior shape is one of several that act as slightly lighter-toned playing fields for Karolak’s zinging shots of color, arenas of experimentation whose brightly pigmented linear borders seem to simultaneously defend against and nestle within the composition’s enveloping fields of black. Look carefully at the chocolatey gray he has laid beneath the pipeworks of green, blue, and black angled lines in “Untitled (P-1642)” (2016), or the warm, rusty violet-gray he encloses within the odd, peaked-roofed-house-like structure in “Untitled (P-1661)” (2016), and you’ll notice that the grays are painted in succeeding coats of light over dark, with the latter edging the boundary of the lines like a halo or stain, juicing the color and ramping up the solidity of the stroke. All this is to say that Karolak has opened up his pictorial imagination to a diverse range of interactions and approaches, such as painting the gessoed linen surface with an undercoat of violet (“Untitled (P-1709),” 2017), which is then covered entirely in black with the exception of about three dozen dots, where the initial color peeks through with a special luminosity. All of the paintings discussed so far are smaller in format, from 13 to 16 inches in height and 13 to 15 inches in width. These works tend to be spatially compact and rhythmically intense, while the larger canvases (two at 66 by 58, one at 69 by 61, and another at 46 by 40) feel more open and amorphous, less spatially beholden to the four edges of the canvas. 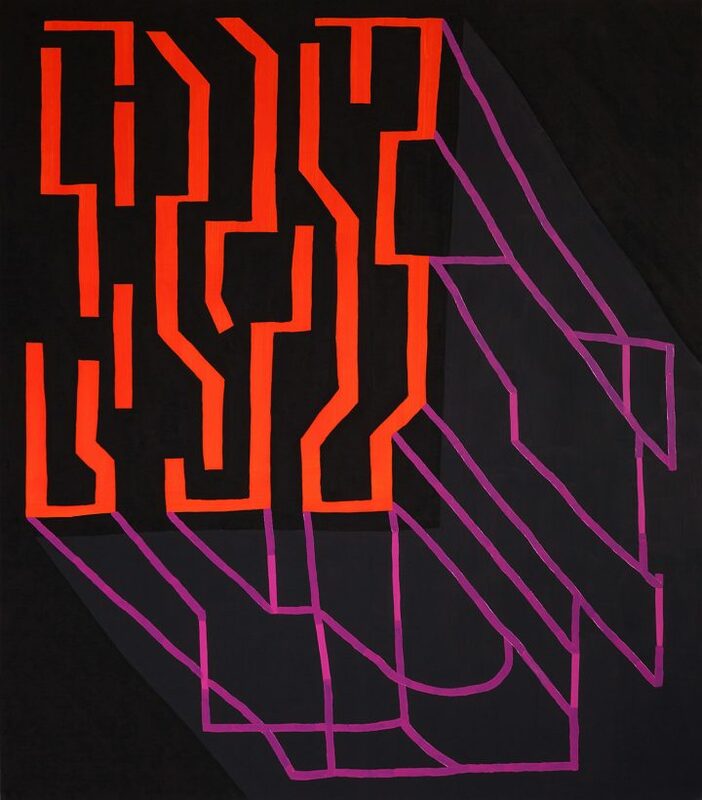 The most striking is “Untitled (P-1714)” (2017), with its vertical, zigzagging orange dashes coupled with a diagonal set of straight and looping purple lines that thrust the orange strokes forward in space, while a barely discernible gray field hovers like a geometric shadow behind the purple diagonals . 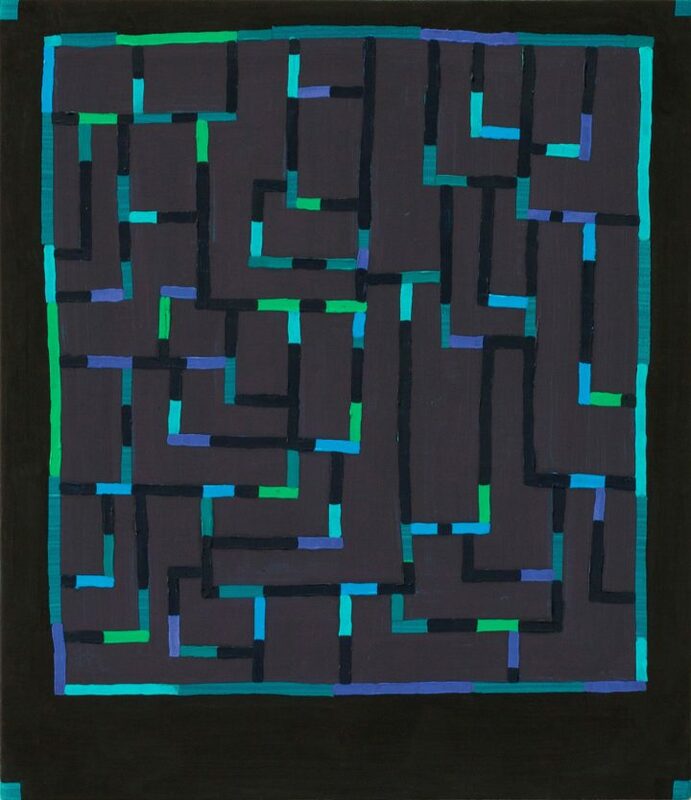 The smallest of the four large paintings, “Untitled (P-1665)” (2016), offers a house-like image similar to the one in “Untitled (P-1661),” mentioned above, this time decked out in emerald-green and yellow-green lines, but in a much more sober arrangement of shapes, as if the larger size had invited artist’s innately classical sensibility in through a back door. The other two large canvases fuse together a congregation of irregularly drawn shapes, with a hint of figuration, though they steer clear of semi-abstraction. The irony, of course, is that after having gone to such lengths to understand why Karolak’s black grounds feel so right, he may turn around and spread one of his warm gray fields across the entire picture plane, or just as easily decide that his ground should now be sea green, or cobalt blue, or hot pink. It goes without saying that an artist of Karolak’s caliber could change on a dime and have very good reasons for doing so. This is not idle speculation, given that his smaller works of a few years ago were based on sets of multicolored grids, coming off as a separate body of work from his large black paintings. But it’s an easy bet that whatever direction he takes, for whatever reason, will be captivating to think about and look really good. Jason Karolak: Prospects continues at McKenzie Fine Art (55 Orchard Street, Lower East Side, Manhattan) through October 8.